The season of fleas is already set and it’s high time to prepare all your tools and weapons against the war of fleas in order to protect your lovable companion from the dangerous effects of these nasty parasites. These pesky dark creatures thrive heavily during the summer as they prefer temperatures of 65-80 degrees and humidity levels of 75-85 percent. Through contact with other animals or fleas, dogs and cats often get infested with fleas. These dark pests jump from one animal to another with the help of its strong back legs. As fleas do not have wings unlike other insects, they can’t fly. Normally, flea bite causes itching and redness but for more sensitive or flea-allergic animal, this itching can be quite intense and may lead to severe conditions like inflammation, hair-loss, secondary skin diseases and in worst cases even flea allergy dermatitis. In order to avoid these blood-sucking pests let us find here the information that will help you overcome the flea infestation in your pets. How do you know that your pet has fleas? These are dark copper colored and about the size of pin head. These dark creatures like to stay away from light, so you can find them mostly within furry areas and on the inner thighs and pet’s belly. You need to even look for flea dirt which looks like dark specks scattered on the skin surface. This is actually flea feces and is composed of digested blood. When you pick some of them and place on wet towel and find that they are spread like small blood stain, then this is definitely flea dirt and your dog or cat has fleas. Let us understand flea life cycle. Flea life cycle is quite strange and therefore it is necessary to understand it. Learning about the different life stages of fleas and how they dwell from one life cycle to another will help to eradicate them effectively and completely. Fleas pass through various stages to complete its life cycle – from egg, larva or nymph, pupa or cocoon to adult. The length it takes to complete the life cycle depends on the environmental conditions. A flea might live a year and a half under ideal conditions. Right temperature, food supply, and humidity are the optimal factors. Usually, an adult flea only lives for 2 or 3 months. Without a host for food, a flea’s life might be as low as a few days. Under right conditions, a flea can complete its entire life cycle in just 14 days. The immature stages are quite resistant to freezing temperatures. 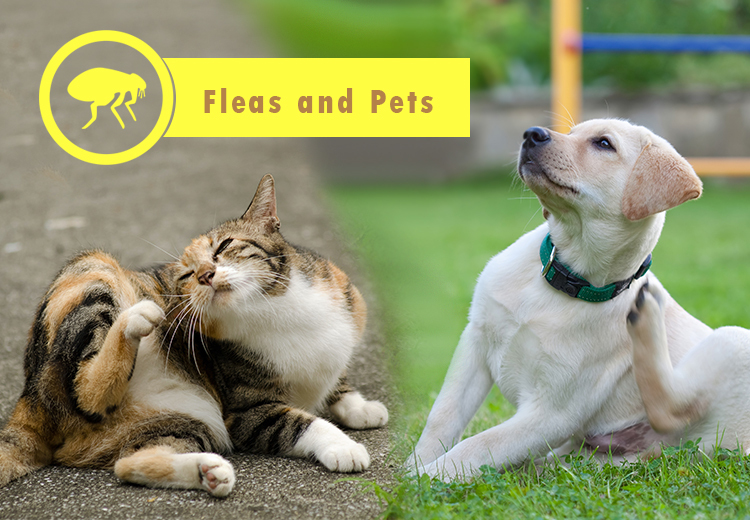 A female flea can lay hundred eggs over her life span and when these eggs develop into adult fleas under right conditions, you can find thousands of them on your pet. And when these pesky blood-sucking creatures dwell on your pooch or kitty, the condition is really miserable. Therefore, for pet caretakers it is always crucial to avoid fleas on the lovable companions. With the help of flea control medications, you can certainly prevent these dark creatures from infesting on your pets. Monthly treatment always helps to not only treat these creatures but also to control them from attacking your lovely pets. Do ensure that you also treat your house and surroundings with flea preventive treatments to prevent any further flea infestation. « Assistance Dogs- Types, Resources And Standards!